4. Click the link to the Pandamonium server noted above in the VOICE CHAT LOGIN box (viewable by members only). If you end up using something different for your username (or already have an account with a different name set up), send a PM to Kaisa letting her know so she can hook you up with the right member permissions on the backend. If you want to text chat with guildies while at work, you can access Discord directly from your browser: https://discordapp.com/channels/@me (be aware that Push-to-Talk does not work in the browser interface - you will need to download the desktop app to use voice chat). Some games (like SWTOR) that must be run as administrator require Discord to also be run as administrator for push-to-talk to work correctly. Quit Discord (right click the Discord app from your task/system tray in the lower right corner and select Quit Discord - don't just close the open window, as it will continue to run in the background). Right-click the Discord shortcut and click "Run as administrator" (or select Properties, Compatibility, check "Run this program as an administrator", and then Apply). If someone can successfully use PTT while in the Discord window, but it stops working while in their game window, this is most likely the issue. In the lower left corner select User Settings, Notifications, and then uncheck "PTT Activate" and "PTT Deactivate". Under User Settings select Voice and then set your Input Device, Output Device, and Input Mode (Push to Talk). This link is good to troubleshoot audio issues. Under User Settings select Account and then Change Avatar. This link is a handy walk-through. Under User Settings select Overlay and Enable. Then, under Games select the game(s) you're playing. Once in-game you hit Shift-~ to turn it on. Make sure the game you are running is being run as administrator (assuming you've now set Discord to run as administrator). Basically, they need to be the same. Right-click the text channel to hide and click the Mute box. I highly recommend doing this for all team channels that are not your own. Then, at the bottom of the text channel list, select "HIDE MUTED". Right-click a voice channel and select Instant Invite. 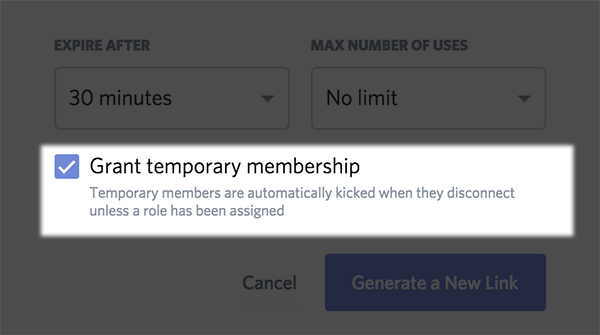 Click the Link Settings cog in the lower right corner of the Invite People to Pandamonium window that will pop up and select the "Grant temporary membership" box. Then click the "Generate a New Link" button. Copy and share the link with your guest. They will be automatically kicked from the server once they disconnect (hence why it is referred to as a Guest Link).